2 hours away from the Tokyo Metropolitan area, the following are access methods to Minano by train or car. From Kan-etsu Expressway Hanazono Interchange to National Route 140 toward Chichibu. From Minano Yorii Bypass (Toll), Minano Interchange to National Route 140 "Otsuka"
From Minano Yorii Bypass (Toll), Minano/Nagatoro Interchange to "Minano/Nagatoro Interchange Exit"
Pass through Shomaru Tunnel on National Route 299 and head toward Chichibu. At the intersection of National Route 140 “Uenomachi”, turn right toward Nagatoro. Take National Route 140 Karisaka Road, take the Karisaka Tunnel (Toll) and head toward Chichibu. If coming from Ikebukuro Station on the "Seibu Railway"
Take Seibu Ikebukuro or Limited Express Red Arrow (Limited Express fee + regular fare) to Seibu Chichibu. Exit train at Seibu Chichibu. Walk 3 minutes to Chichibu Railway "Ohanabatake Station" and go in the direction of Hanyu/Kumagaya. Exit at Minano Station. On JR Kumagaya Station, head in the direction of Chichibu Railway Mitsumineguchi Station and exit at Minano Station. * For individuals taking the direct train "Chichibu Railway" toward Nagatoro Station from the "Seibu Railway" Ikebukuro Station. How to IC card fare adjustments using the direct train from Ikebukuro Station to Minano Station. After doing your fare adjustment at the Minano Station for the difference between Ohanabatake Station and Minano Station, please receive the communication slip so that you can do your fare adjustment on your way back at Seibu-Chichibu Station. For those using the direct train on their return home, please have a communication slip issued for Ikebukuro Station to do your fare adjustment. 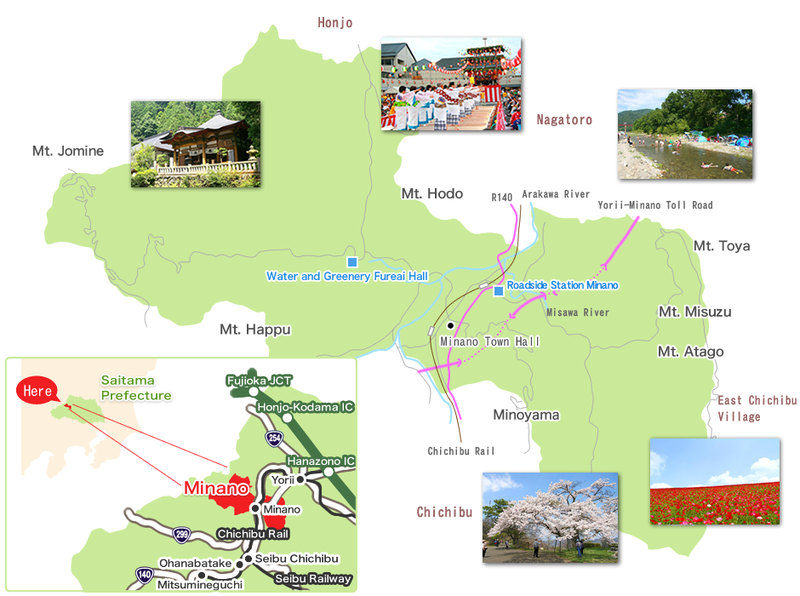 For your Minano and Chichibuji tourist needs, let Chichibu Marutsu Taxi take care of your needs. Feel free to contact us for reservations and any questions you may have. We have an abundant number of recommended tourism courses, so ask us about them. We also provide jumbo taxi services, on-demand taxis, and handicap-accessible vehicles. For business or for family and friends, we will assist you on your trip. The Minano Municipal Bus has two lines: the Hinozawa Line and the Kanezawa Line. The Chichibu Area Tourism Organization provides services for the Chichibu Wide-Range Tourism Rent-a-cycle "Cycle at Chichibu". The cycle station for "Cycle at Chichibu" rents out bicycles that can returned at any of our stations. Drop off your bicycle at any of our stations when you are finished for a worry-free cycling trip.